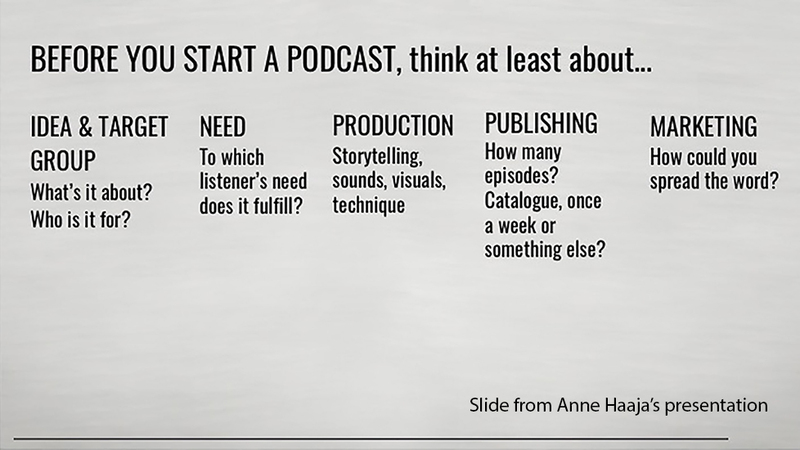 Last week, Aalto Studios hosted a casual lecture about a very up-an-coming topic, podcasts. Even though podcasts are not yet as widely consumed in Finland as they are in some other parts of the world, the demand is constantly increasing. The discussion revolved around general podcast-making and publishing, and the question whether it could be an effective pedagogical tool. Event speakers included Anne Haaja from Yle and Vesa Paajanen from University of Eastern Finland. Haaja introduced Yle Areena’s audio content and discussed Yle’s strategy for producing audio, such as radio and podcast programs. According to Haaja, Yle’s audio content consumption has grown week by week in 2018. The most popular topics seem to be science, history, politics, drama and comedy. Haaja thinks that podcasts are becoming more popular, because they are downloadable and the stories are usually very current and compelling. Since podcasts are only based on audio, the quality has to be excellent. – Consumers today are so used to flawless quality in podcasts and other audio content, any technical imperfections will make a listener lose interest immediately, Haaja stated. Our other guest speaker, Dr. Vesa Paajanen from University of Eastern Finland discussed his use of mp3-podcasts as a pedagogical tool. He has been recreating his biology lectures into recordings that summarize the course content to facilitate learning. – One of my students said she couldn’t have passed the course without my podcasts. That’s when I realized how effective they can be, Paajanen said. As the podcasts have been a huge hit in Paajanen’s teaching, he has continued making them for several years. He said he believes in podcasts having a huge potential as a tool for university-level teaching. Are you interested in making your own podcast? We have a few recorders available for checkout at Aalto Takeout!